Irish student student Mark Sands died while on an exchange in Texas. 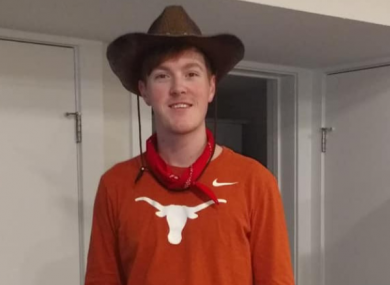 A GO FUND Me page set up to help the family of an Irish student who died while on an exchange in Texas has surpassed $25,000. Mark Sands, a 21-year-old a UCD student from Blackrock in Co Louth, died on Sunday following a road traffic collision in Austin while he was riding a small scooter. The crash happened in the early hours of Friday morning and the student underwent emergency brain surgery. The Go Fund Me page outlines that the young man was in a critical condition in the days following the crash before succumbing to his injuries on Sunday. He was then taken into surgery so his organs could be donated. The student had been on an exchange in The University of Texas and was a member of the Texas Iron Spikes, a community organisation affiliated with the college. The group’s president Brian Flannery sent his condolences to Sands’ family and described him as “an incredible man who always brought a smile to those around him”. “He was a kind, loving, and caring individual who regularly put others first. He was truly a blessing to know and touched so many lives for the better,” he added. Mark never met a stranger or someone he didn’t like. He had a passion for everyone he knew and he always looked out for others. However, in this moment, he needs us to look out for him. We are overwhelmed by all your support. Your comments are uplifting and a great comfort to us. Marks organs are being harvested at 10am here, 4pm Irish time. Could you please play the U2 song Elevation and take a few minutes to remember him. Mark’s death notice on RIP.ie says that his “short life was a celebration of love, kindness, intelligence, humour and high spirits”. As well as by his parents and extended family, Mark will by “tragically missed” by his two sisters. Email “Fundraising appeal for Irish student who died in scooter crash while on exchange in Texas”. Feedback on “Fundraising appeal for Irish student who died in scooter crash while on exchange in Texas”.